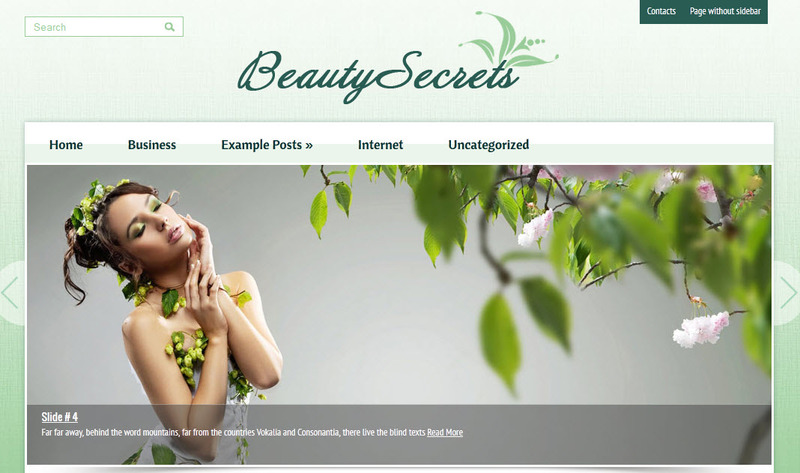 Have a blog that is dedicated to beauty and fashion with one of the most appealing WordPress themes, BeautySecrets. The main green color used for its backgrounds and menus brings freshness and charisma to the site and makes a great first impression. The beauty is all around this marvelous theme, from the eye-catching slideshow that welcomes visitors, to the outstanding blog posts that you will arrange for your site. BeautySecrets inspires you to be daring and provocative when creating your site and wrap up your ideas and interests in an extraordinary appearance that is memorable. The great secret for the success of this theme is the harmony of fresh green colors and the simple layout that assures the easy navigation and a pleasant visual experience for your readers. Do you want to share your masterpiece with the big audience worldwide? All you have to do is to use the social share bar that will navigate you to the most world famous social media. The browsing through the site is easy and effective thanks to the horizontal menus on the top and the well arranged sections for categories, archived posts, and comments and featured content that you can find next to the blog posts. The responsive layout of the theme makes it attractive and fully functional on all screen sizes, laptops, tablets and smartphones that you can use for internet browsing.